It’s time to roll out the Red Carpet and settle in with your besties. On Sunday night, the glitz and the glam of the the Academy Awards returns. The fashion will be fabulous as the stars shine on Hollywood’s biggest night. And today we have a recipe to help make your Oscar Night fabulous, right there at home. Just like Hollywood’s starlets, you’ll be surrounded by a sea of handsome tuxedos as the winners are announced. Granted, these tuxedos will not be on the likes of Bradley Cooper and Ben Affleck. But these little guys are just as cute. So put down the bag of cookies and boring old cupcakes. Oscar night calls for a glamorous dessert with a real sense of style. 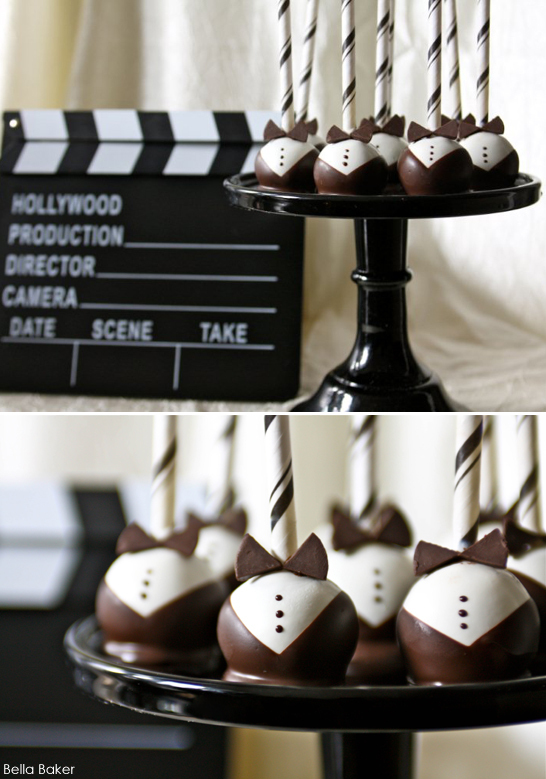 It calls for charming cake pops, all dressed up and Red Carpet ready. 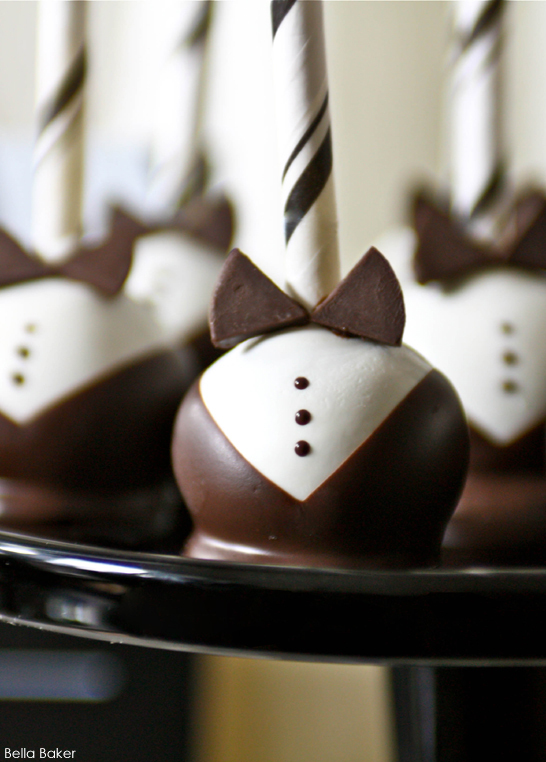 Today we’re learning to to make these smart Tuxedo Cake Pops, created by Lauryn Cohen of Bella Baker. Lauryn Cohen of Bella Baker shares her excitement for Oscar Night…. To make the cake, preheat the cake to 350 and spray a 9×13 glass baking dish with nonstick spray; set aside. Whisk the flour, cocoa powder, baking powder, baking soda, and salt together in a bowl; set aside. In a measuring cup, mix together the buttermilk and vanilla extract; set aside. In the bowl of a stand mixer fitted with the paddle attachment, beat the butter and sugar together on medium-high speed until pale and fluffy. Add eggs, one at a time, beating well between each addition. Reduce mixer speed to low and add half of the dry ingredients, followed by the buttermilk and vanilla. Scrape down the sides of the bowl; then add the remaining dry ingredients, beating until well incorporated. Pour batter into prepared pan and bake 30–35 minutes, or until a toothpick inserted in the center comes out clean. Remove from oven and let cool. To make the frosting, mix the butter, confectioner’s sugar, and cocoa powder in a bowl; add the milk one tablespoon at a time until the frosting reaches a smooth, creamy consistency. Note: You can use store-bought chocolate frosting instead of making frosting from scratch. Break the cake into a large bowl. Using your fingers, crumble up the cake until no large chunks remain. Stir the chocolate frosting into the bowl of cake crumbs, 1 or 2 tablespoons at a time, until the consistency is thick and the mixture can be rolled into balls easily. If it is too dry or too moist, you will not be able to roll the mixture into balls, which is why it’s important to add the frosting slowly. Form the cake mixture into 1 1⁄2–2 inch balls with your hands. I often weigh the cake balls so they are uniform in size; they should weigh 0.6 to 0.7 ounces. Place balls onto baking sheets. Chill in the refrigerator for about an hour. Put the white candy melts in a microwave-safe bowl. Melt in the microwave in 30-second intervals, stirring vigorously with a spoon between intervals. It should take two or three 30-second intervals for the candy melts to melt completely. Remove the cake balls from the refrigerator. Working one at a time, dip the tip of the lollipop stick in the melted white candy melts; then insert it into the cake ball until it’s about halfway through. Holding the stick, dip the cake ball into the white melted candy, rotating to coat evenly. Tap the lollipop stick gently against the side of the bowl to remove any excess candy melt, then place cake pop onto parchment paper to dry, so the lollipop stick is upright. Repeat until all cake pops are complete. Melt the chopped dark chocolate in the microwave. Dip just the bottom of each cake pop in the melted dark chocolate, holding the pop in a diagonal direction and dipping it into the coating until half covered. Remove and dip the other side in the opposite diagonal direction to form black V-shaped jacket. Place the pop, ball side down, back onto waxed paper. Use a toothpick to dot three small chocolate buttons into the V to create the effect of buttons on the tuxedo shirt. Finally, cut pieces of chocolate into triangles to use as bow tie. Adhere to cake pop with a small amount of melted chocolate. Makes about 50 cake pops. Great idea for the Oscars! Perfect for the Awards party coming up soon! I too have made tuxedo chocolate dipped strawberries but your cake pops are terrific and so perfectly dipped. Wow I don’t think mine have ever looked this perfect. You’re a natural! Do you think milk chocolate could work instead of using dark chocolate?